A rather cheap and pedestrian sci fi film with an absurd premise, lots of “stuff” happening, rather unconvincing acting, somewhat dull dialogue and a largely unimpressive “monster’ character. Perfect viewing fare for a rainy afternoon! In your endless wanderings throughout the 1950s classic sci-fi universe, you manage to trudge into yet another film world, this time with your coat collar turned up high around your neck and your coat buttoned up tightly against the onslaught of wind and rain from a thunderstorm. As you make your way through a mountain forest, you fail to notice a warning sign in the form of a 16th century axe embedded in a log of wood. You eventually emerge out of the forest and enter the small mountain village of Pine Ridge, California. As has often been the case, you have stumbled into a world where events and characters are rather predictable and formulaic and where everything eventually leads to an inevitable conclusion. Just take a look around you and what do you see? Pine Ridge: Just a “wide spot in the road.” If it still exists years from now, people will describe it as being so small the main road goes straight through the car wash! See the small knot of Pine Ridge’s finest citizens busily airing their concerns about a series of livestock mutilations that have taken place. “Something mighty strange going on here!” says one. “Just ‘taint natural” says another.” Not only that, but a local man by the name of Harold Banks has been found dead and was killed in a manner similar to the livestock. Unseen and unheard by the townsfolk, you are able to easily eavesdrop on their conversations and learn that the incidents seem to have been happening around the area known as “Devil's Crag.” Listen now as Sheriff Parker explains that the coroner's report shows that “Banks died of a brutal beating at the hands of a person or persons unknown." Explanations aside, you feel the same revulsion as the café owner feels when he pulls back the tarp covering the dead body in the back of the truck. 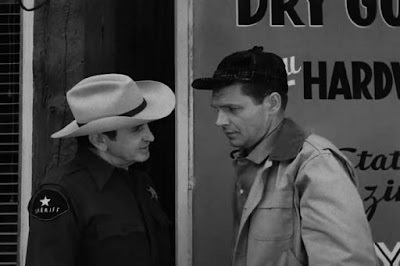 Someone expresses the prevalent feeling when he states that “it’s supernatural.” See the Sheriff’s determination not to be swayed by talk of supernatural causes as he orders everyone to stay away from the vicinity of Devil’s Crag. You’re all too familiar with this scenario. Combine something that seems to defy rational explanation with a lack of information and add mob mentality, ignorance and fear and what do you have? Keep watching and listening and you’ll soon find out. Your attention is suddenly drawn to a rather sad and pathetic example of racial and minority stereotyping, so typical a feature of the many film worlds you have travelled through. There before you is an intoxicated Indian, Joe who giggles inanely and warns, "All white men die." Before he is driven away by the Sheriff, you hear Indian Joe warn him that “the spirits of my people return for their revenge” and that, "people who walk on Indian grave, die." Look further out yonder and you’ll notice a local geologist by the name of Wayne Brooks sauntering into town after being three days away in the woods. Yep, you guessed it! 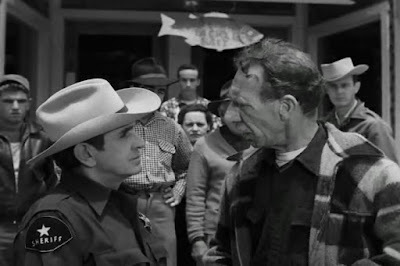 Here we have the introduction of a likely conflict between this character and the Sheriff who has just declared Devil’s Crag off limits and has heard about a confrontation that took place between Brooks and Banks several days before resulting in the former being run off the Banks' property with a shotgun. Within the one-dimensional thought processes and conservative mindset of our authority figure Sheriff, suspicions abound! As you wander down the main street with the Sheriff’s suspicious questions directed at Wayne ringing in your ears, you suddenly catch sight of a Jeep coming to a stop. Behind the wheel is Dr. Frederick Cleveland, an archaeologist. Sitting next to him in the vehicle is his daughter, Janet Cleveland. You know the familiar face of Dr. Cleveland from your journeying through the various film worlds of the classic sci-fi universe. It seems as if repeated reincarnation of the physical form is an established fact in this universe. It’s a familiar face that has belonged to anyone from an army general through to a Martian. It’s the kind of face that you are always glad to see. As the sheriff drones on about two tent poles sticking out of the back of the Jeep requiring a warning flag, you overhear that Cleveland is planning on conducting archaeological research in the area and that Brooks was once a student at professor Cleveland’s college and had attended a few of his lectures. 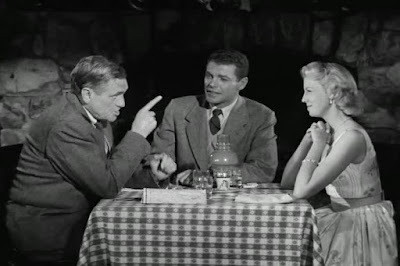 Despite none of the characters being able to be aware of your presence in this film world, even you begin to lose patience with Parker and his warning Cleveland to be on his guard and especially with whom he associates, implying of course, Wayne. Despite the efforts of kill-joy Parker, you’re pleased that Brooks, Cleveland and Janet have agreed to have dinner at the lodge later that day. Take note of Cleveland’s positive reaction when Wayne informs him that he has uncovered a few artefacts. A delighted Cleveland asks to see them stating that, "This might save me a great deal of time and effort." ‘To do what?’ you’re thinking to yourself. As if in response to your silent inquiry, Cleveland tells Wayne, "I'm looking for a giant, but one that has been dead for over 500 years." You learn that Cleveland has been working on a book about a Spanish conquistador and that in particular he wants to know what happened to the “Diablo Giant” by the name of Vargas. Vargas was the name of a “brutal” and “degenerate” lieutenant who deserted an expedition led by a man named Ptolemy Firello and with his band of renegades headed inland in search of Indian gold. After dinner you join Janet, the professor and Wayne at the latter’s small field lab. As you watch the professor admiring the Indian artefacts, you almost drop your bundle as Janet suddenly cries out when she is frightened by a lizard she sees in a box on the table. It doesn’t help all that much when Wayne explains that the creature is extinct and that he discovered it sealed inside a rock in a state of “suspended animation.” Yep, you’ve seen this before in your wanderings. Set up a proposition however unlikely and if it applies in one case then by golly it’s sure to apply in another case that’s central to the film’s premise. When Janet and Wayne leave the lab to see a movie, you know full well two’s company and three’s a crowd, even though they don’t know you’re there! Besides, you have probably wandered through the particular film world they’re going to see already. So, you decide to stick with Cleveland as he examines the artefacts. 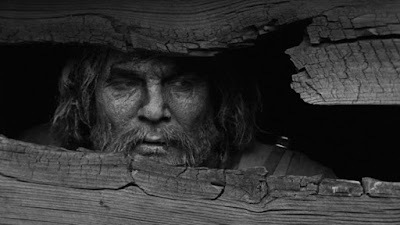 However, you wished you hadn’t as you almost soil your pants when you spot Indian Joe peering through the window. ‘What the hell does he want?’ you wonder. Idiot, you forget that he can’t see you! It’s a relief to you when Wayne and Janet return from the cinema. While they were on their date, the professor had been busy. He asks them to watch closely as he pushes a couple of pieces of rock together to form a cross, a Christian cross made by an Indian demonstrating that they had been influenced by Europeans long before settlers had colonized Indian lands. You know as well as Cleveland that this relic is an important lead and you can well appreciate his joy when Wayne volunteers to take him to the very spot where it was found. Nothing will stop you from joining them at the lodge for breakfast next day, except perhaps for the fact that after brekkie they will be going to……DEVIL’S CRAG! The next day you find yourself perched uncomfortably in the back of the Jeep as it bumps its way to its destination in the mountains. The Jeep eventually stops near a pile of boulders. Janet gets out of the Jeep and is alarmed at seeing what she believes to be a face in a clump of bushes. You don’t see anything but it’s enough to make your heart beat a bit faster and raise the hairs on the back of your neck. Probably just a deer…. The next morning you join Wayne as he explores the area. As he notices a broken branch, you catch sight of Indian Joe hiding behind a boulder. You also notice that he is armed with a rifle and seems to be skulking there with malicious intent. Your worst fears are about to be confirmed when Joe takes a shot at Wayne. No, not at Wayne, but apparently in his general direction. Either way, there’s nothing you can do about it. Later back at camp, Wayne tells Cleveland that the area is changed from how he remembers it and speculates that a recent electrical thunderstorm has altered the landscape which now has “disturbed brush and toppled rocks.” But you feel that is just the rational scientist in him grappling for meaning. Perhaps there is a bit more to it than what such a neat and tidy explanation can provide. 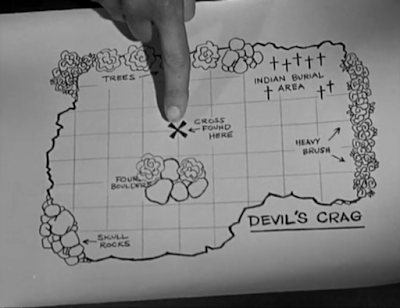 Perhaps the answer can be found at Devil's Crag and in the clues provided by a map showing where Wayne found the cross. It is decided that they (meaning the men) will use metal detectors to search for Spanish artefacts seeing that it was the Spaniards that used a lot of metal compared to the Indians. And what of the lovely Janet? Why, in the tradition of many of the classic sci-fi film worlds within the classic 1950s sci-fi universe, she will be expected to perform her seemingly pre-ordained female role – take care of and tidy up the camp and prepare lunch. Never mind Janet, you may now have little recourse but to exclaim “You men have all the fun!” but in 30 years’ time your daughter will be declaring that “Girls just wanna’ have fun!” while your granddaughter in the 21st century will find a way to prevent her man from having too much or indeed any kind of fun! As much as it appeals to you to hang around the camp with the lovely Janet close-by, you decide to tail Wayne and Cleveland as they do ‘blokey boys with big toys stuff’ like searching the area with a metal detector. After a while you start to feel tired just by watching them search on and on without success. Hooray! Here comes Janet with coffee but you forget that you don’t consume food or beverages while you travel through the classic sci-fi universe. You are almost surprised when Janet suddenly tries to convince her father to give up the search. She asks him, “don’t you know when you’re licked?” You’re equally surprised when the professor actually agrees to do so due to his lack of progress over the past three years. He admits that his endeavours have been just part of “a dream, an obsession…a long gamble” which he has now lost. You sense that to do what Janet suggests would practically break the professor’s heart. Janet decides to have a go at using the metal detector herself before they all pack up camp for the return trip to Pine Ridge. You follow close behind her and shake your head at her “unique” metal detecting technique. You stop and watch (and shake your head yet again) as Janet sits down to rest by a fallen tree and applies some makeup to her face, essential to any foray into the bush! As if on cue, here comes lover boy, Wayne! What a gentleman he is as he returns to the log to retrieve Janet's compact which she dropped. In accordance with the unwritten law concerning how the best discoveries are made quite by accident, the metal detector goes nuts as it registers the presence of metal. Sounds more like a Geiger counter registering radio-activity! You can sense that a storm is literally and figuratively approaching and is about to hit. Wayne believes a lightning strike hit the same rock formation where he had earlier found the live lizard entombed in a piece of rock. As quick as lightning bolts, theories will soon flash into existence about Vargas: that he was buried as a result of an epidemic, that he was placed in the burial ground and that he is still alive! As the storm hits and the professor and his daughter head back to camp, you decide to hang back with Wayne. He soon locates the Diablo Giant’s axe, but not being the King Arthur type he is unable to pull it free. As Wayne returns to Camp, you stand transfixed at the sight of a hand moving on the ground beneath a log. Under a covering of leaves, a pair of eyes open and look around. The hand and eyes belong to the emerging body of The Diablo Giant, Vargas who amidst the crashing sound of thunder and the flashes of lightning, stands and surveys his surroundings. Now, you have travelled through sci-fi film worlds replete with monsters of every description ranging from long extinct dinosaurs and giant octopuses through to Kaiju creatures and enormous insects. And what stands before you right now? A big ugly Spanish conquistador in need of a good hosing down with water! Barely able to supress fits of laughter, you head off back to the camp site. The next day, you accompany Wayne, Cleveland and his daughter to where Wayne located the axe handle. You gape in astonishment to find that it is no longer there. After a search around the area, a medallion and a breast plate are located. Questions soon arise as to whether Vargas could still be alive. More pieces of armour are found and are placed on a post. That evening, while Cleveland works on his notes, Wayne and Janet go into the woods for a walk. You decide it would be better if you remain in camp with Cleveland for obvious reasons. Later that night after Janet and Wayne have returned, you witness events which you are powerless to do anything about. You notice that Vargas has retrieved his armour and gold medallion and has put them on. He sees Janet’s silhouette through the wall of her tent and as she undresses, he slowly approaches. As he does so, he knocks over a can which seems to have startled Janet. She tries to fire her gun but only succeeds in shooting her bed dead but the shot has sufficiently startled Vargas causing him to leave the camp with alacrity. You hear Janet tell the others that she heard footsteps. Suddenly Wayne notices that Vargas’ armour is missing while Cleveland notices a huge footprint nearby. The others can only guess at the cause of these occurrences, but you know! Later, you learn from Cleveland that the armour of the giant was better preserved than the others. He speculates that there is something unusual in the soil – some element that acts as a preservative. He also speculates that Vargas was not dead, but unconscious when the Indians buried him and that his unusual strength helped to sustain him. 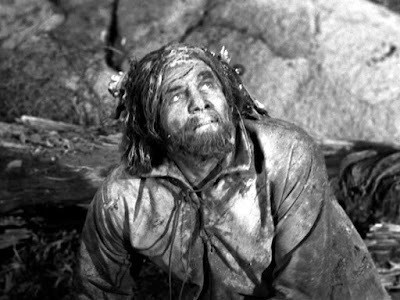 He was mistaken as being dead by the Indians while in fact he was held in suspended animation by the substance in the soil. Lightning from the electrical storm “rekindled the spark of life” and reanimated Vargas. Oh Oh! Here’s trouble in the form of Parker. He’s turned up here to arrest Wayne for the murder of Anne Brown! It turns out that after Charlie had left to go to work at the lodge, his sister Ann was attacked and killed while taking a bucket to fetch water from a well. Wayne tries to explain that he hasn't seen Ann in over a week but the sheriff produces the medallion that was found in Ann’s hand as proof of his involvement. You know that Wayne is innocent and you join Parker as he leads Wayne away in handcuffs. You concur with Wayne’s explanation that someone must have stolen the artefacts and that the person who did so is responsible for Ann’s murder. 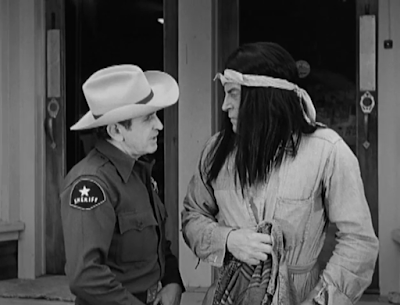 On the way to town, Wayne manages to convince the sheriff to drop by Indian Joe’s cabin. Upon arrival at the cabin, it appears to be empty. Suddenly, a cold slice of shock makes its way from the pit of your stomach, through to your chest and on up to the back of your throat as you catch sight of Indian Joe’s bloodied carcass hanging up on the wall like a slaughtered deer. When you arrive in town with Wayne and the sheriff, you spot a large crowd of people in a fairly ugly mood. Cleveland then pulls into town and reports that the giant Vargas has Janet. It turns out that while Cleveland was making a plaster cast of the large footprint, he was knocked out by Vargas. Janet came out to investigate and while she tried to flee using the Jeep, Vargas nabbed her. You decide to stick with Wayne and Cleveland as they “borrow” the sheriff's car and drive back to the mountains. At the camp site, Cleveland manages to chop off the chain of the handcuffs thereby allowing Wayne to grab a gun and run into the woods after his quarry. You hightail after Wayne until you soon catch sight of Vargas carrying Janet over his shoulder. You marvel at Vargas’ strength when he pushes a giant tree towards Wayne, narrowly missing him. Next off, Vargas lays Janet down in a clearing, grabs an axe and takes a swing at Wayne, again narrowly missing him when Janet calls out a warning. Enter the cavalry as the sheriff charges in with guns blazing which manages to scare Vargas away and into the forest. You then get that warm fuzzy feeling when the sheriff apologizes to Wayne and they shake hands. Shucks! With Charlie left behind guarding the camp, the Sheriff’s posse spots Vargas at Box Ledge. Wayne suggests to Parker that the men douse their flares in case Vargas sees them. 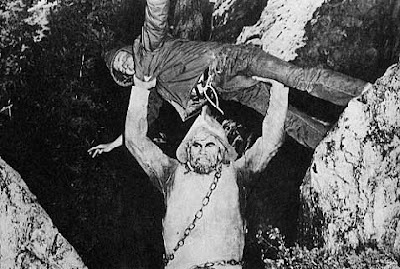 Suddenly you catch sight of the giant Vargas picking up a rock and heaving it, killing one of the men. Shots ring out in response but to no avail as the giant’s armour protects him. After returning to camp. You hear the sound of rifle shots. It seems that Charlie feeling somewhat responsible for the fate of his sister, has grabbed a rifle and gone off to exact revenge. The rifle shots are a signal from Charlie. 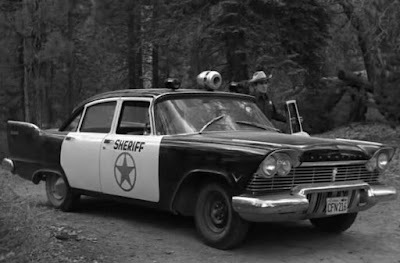 You take off with Wayne and Sheriff Parker to go look for Charlie. You soon find Charlie lying on the ground injured, but he manages to tell Wayne that the giant is heading for the Old Mill. You next follow Wayne to the mill and watch him as he cautiously enters. You stand powerless to help as Vargas suddenly swings and misses Wayne with his axe. You breathe a sigh of relief when Wayne jumps out of a window and at once repeatedly takes to Vargas with a tree branch. Vargas then takes off along a walkway over the dam but Wayne catches up to him and a struggle ensues. Vargas suddenly loses his footing and falls down the waterfall into the river far, far below. You learn that there is no hope of recovering the body as apparently the river empties into a volcanic lake that is practically bottomless. Leave this world behind and enter another. Are choices made when events intervene. A fleeting shadow on the periphery of our vision. Step by step to The End of your journey’s route. 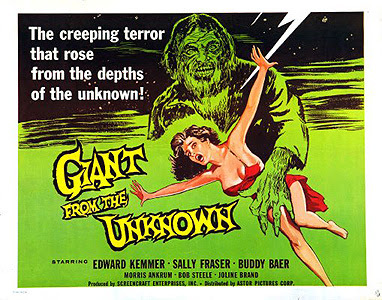 Giant from the Unknown was theatrically released in March 1958 on a double bill with She Demons. The film was shot in San Bernardino National Forest. 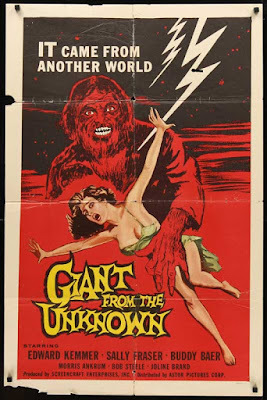 The film was directed by Richard Cunha who also gave us the films, Missile to the Moon, She Demons and Frankenstein’s Daughter. The make-up effects were done by Jack Pierce, who created memorable scary faces for Boris Karloff's Frankenstein (1931), The Mummy (1932) and Lon Chaney Jr.'s The Wolf Man (1941). 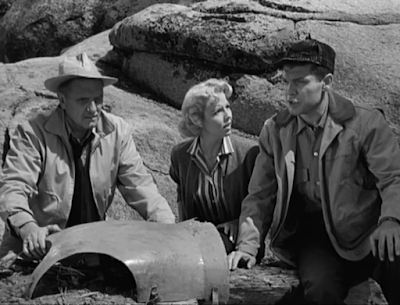 Ed Kemmer who plays geologist Wayne Brooks also featured in Earth vs. the Spider and as Commander Buzz Corey on Space Patrol. Morris Ankrum who plays Professor Frederick Cleveland has appeared in many sci-fi classic films ranging from The Giant Claw and The Zombies of Mora Tau through to Invaders from Mars, Earth Vs the Flying Saucers and Kronos – to name but a few! Sally Fraser who plays Cleveland’s daughter, Janet featured in War of the Colossal Beast and It Conquered the World. Buddy Baer who plays Vargas the giant was brother of heavyweight prize-fighter Max Baer and appeared as a giant in Jack and the Beanstalk (1952), starring Bud Abbott and Lou Costello. 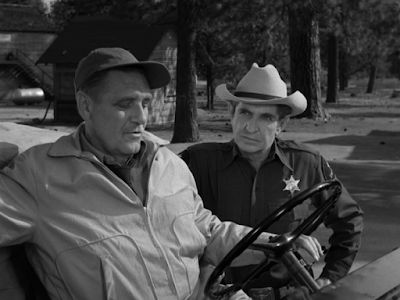 Bob Steele who plays Sheriff Parker was a veteran of over 200 films and a familiar face in Western movies. As far as film monsters go, Vargas seems to be pretty lame. One could say that he is a monster in a moral rather than a scary physical sense. He is described as being depraved and brutal and has remained so even after three and a half centuries of suspended animation. The film does suffer from continuity and subplot development problems. For instance, we are never quite sure why Parker and Wayne don’t like each other. What is the history behind their animosity? They just seem to detest the sight of each other. Next there is the hint of a possible romantic triangle involving Wayne, Janet, and Anne Brown which is never explored or developed. 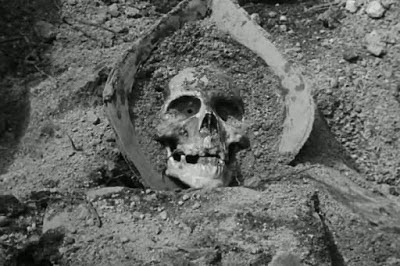 Finally, one has to ask if Vargas awakens after Brooks has located his weapons, then who was responsible for the murder of Old Man Banks and the farm animals at the start of the film? 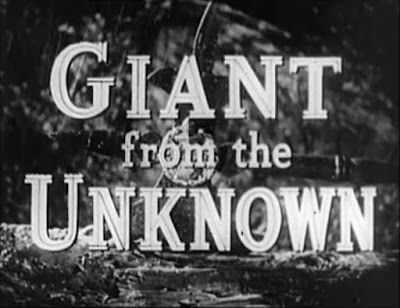 Giant from the Unknown does contain moments of good pacing, and combines some effective creation of eerie atmosphere, and black and white cinematography. In addition, the 77 minute running time doesn’t allow the film to drag too much and Albert Glasser's orchestral score is quite solid and powerful.